When I became Editor-in-Chief at NEHGS in June 2013, one of the new initiatives Ryan Woods and I discussed was a blog for the Society. Current and former colleagues worked with me to establish the blog’s purpose and name, and – in time – got me set up on WordPress. (Two years later, when I was on a sabbatical, three current and former colleagues managed the blog in my absence.) 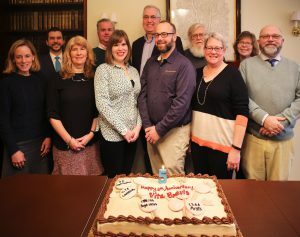 So Vita Brevis has been a cooperative venture from the beginning, relying on the energy and commitment of the NEHGS staff and some dedicated outside contributors to produce fresh content. We managed to wrangle a few of the blog’s contributors to admire the cake. They are, from left to right, Jean Maguire, Ryan Woods, Ellen Maxwell, Scott Steward, Cécile Engeln, Don LeClair, Chris Child, Bob Anderson, Sharon Inglis, Lynn Betlock, and Brenton Simons. 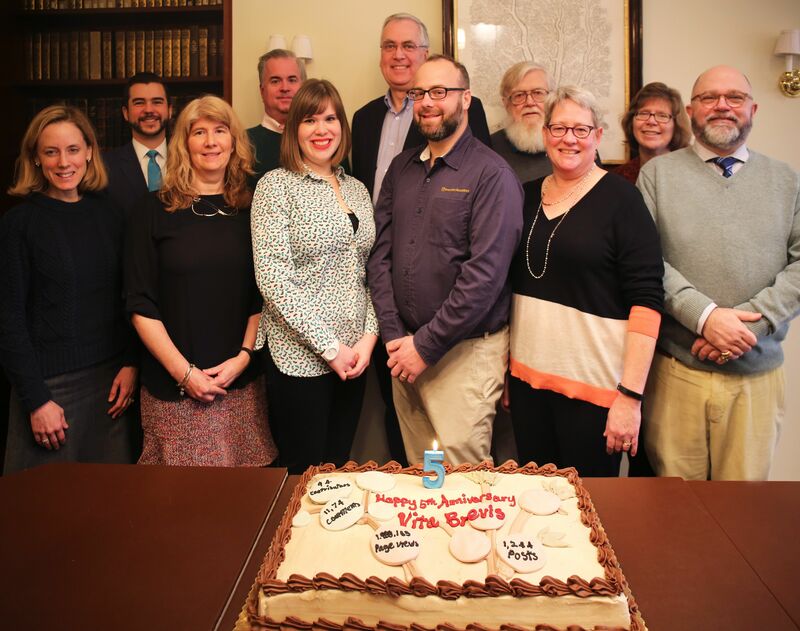 Other NEHGS staff members, many of them contributors to the blog, later joined us for cake and Prosecco in the Society’s Education Center. We have set a strong precedent for future celebrations – we shall see where we are five years from now…! 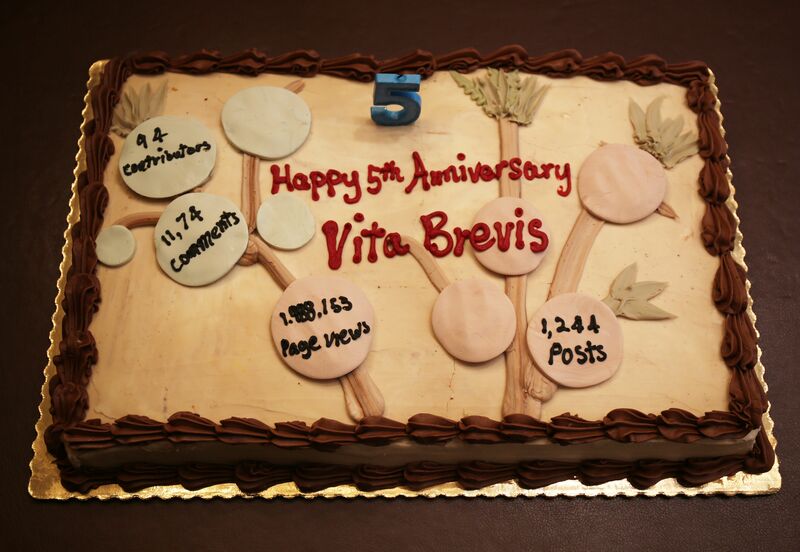 Congratulations to Vita Brevis and its authors on this fifth anniversary. It’s wonderful and enjoyed by so many, including myself. This is just awesome! Thanks for making it all come together Scott – what fun!!! 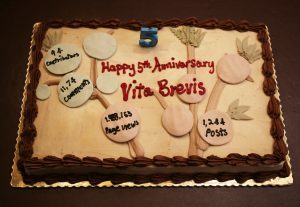 Happy Birthday Vita Brevis, AND MANY MORE !!! 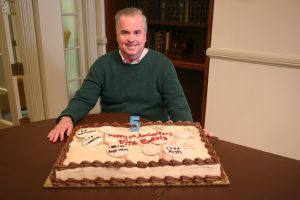 Thank you Scott for all the great postings here at Vita Brevis over the past 4 years or so that I have been part of NEGHS thanks to my sponsor and Katherine’s assistance. HAPPY BIRTHDAY TO ALL and many more years of your kindness and love. Sincerely Yours, Paul Morris Hilton your friend from New Brunswick, Canada. I copied the picture, added the names and know can ‘know’ who some of the bloggers are and, when I next get to Boston, I will be able to greet some people by name. Congratulations on a really well-written and interesting series of blog posts. I like the variety quite a lot. Kudos to all the authors and editors. Thanks, everyone, for your kind comments. Please keep reading — and commenting! Congratulations! The blog has been a great reading and writing experience, Scott, thanks to your steady and wise hand at the helm. I hope you saved me a piece of cake!